CEO James Warburton has declared there’s no “smoking gun” behind his departure from Supercars at the end of 2017, claiming it was always planned as a transition year. Warburton faced media this morning for the first time since his decision to leave the sport, which was announced on Monday. The former television executive’s new position as CEO of advertising firm APN Outdoor has been confirmed, ending Warburton’s four-and-a-half-year tenure in Supercars. Warburton’s exit has shocked many in the sport, with the team owners – who collectively own 35 percent of the business – voicing their disappointment at the move. Media reports this week have claimed that Warburton was prepared to stay on but pulled the pin when a salary increase request was denied by the Supercars Board. “One thing I would like to clarify is just some of the earlier media reports in the week that this was all over a pay dispute,” Warburton declared at the start of his press conference. “It’s complete and utter rubbish to think that you would tender your resignation on a Monday and on a Tuesday, the following day, be announced as the CEO of a publicly-listed company. “It’s been well and truly a transition period, 2017 was always going to be my last year, with our employers, particularly Archer Capital, the 65 percent shareholder. When pressed on the claim that 2017 was always going to be his last year, Warburton clarified that he’d initially planned to transition into another role. “When I say leaving, it was leaving as CEO and transitioning into an exec or non-exec role. That’s probably the slight change,” he said. Warburton says he has no regrets about his time at Supercars and stressed an intention to make good on his efforts to secure as many as two Asian races for 2019 before leaving in December. “I think the strength of our management team is that we’ve been really clear about setting a vision and I think we’ve been very honest with the media about what our objectives are, and we’ve marked ourselves pretty hard against them,” he surmised. “I still plan, as you know, to announce hopefully one, if not two, Asian races by December 22 when I leave the company. “We’re still well and truly in the game in terms of getting that on the agenda. It would be disappointing to leave without ticking that box, obviously. Warburton will help recruit his replacement and said that the company will look for a CEO that brings a variety of skills to the table. When Warburton was appointed in 2013, he became the fourth CEO in five years before leading a period of stability. Unlike previous CEOs, he’s operated without a Chairman. Supercars’ last Chairman, James Strong, died just months into the job in March 2013 and was not replaced. “I think everyone’s an individual, what I would say is I think every CEO brings a unique blend of personality to the job,” said Warburton of what the company will look for as it recruits. “This has been a very different job to what it’s been in the past. Everyone talks about previous CEOs, but those CEOs worked under and with a Chairman. “This has been kind of a collective job between Chairman and CEO, obviously they need someone that has authority, vision and can have a relationship with the media and fans and bring the types of relationships to the business whether they’re in the media world or the corporate world. “I don’t think there’s any shortage of outstanding candidates putting their names forward, we’ve identified a whole host of people we’re talking to, which we’ve done over the last six months and I think we’re in very good shape. 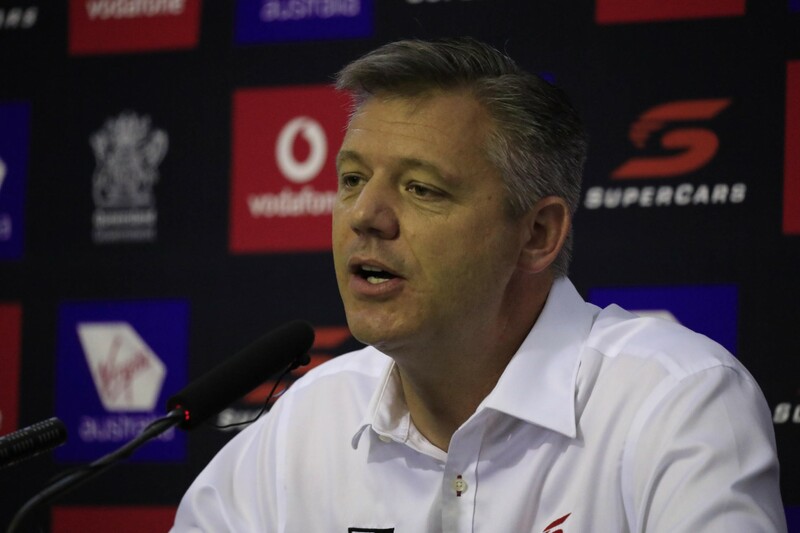 “I think moving a lot of the team to Sydney and having the events team and the motorsport team and of course Shane Howard who’s been acting CEO twice in his time at Supercars, we have an incredibly strong team across the board.